The use of the matutishan (or sweat lodge) is directly related to the quest for energy, both physically and spiritually. 1:56 min. - The use of the sweat lodge, or matutishan, is an Innu strategy for increasing energy. It’s a place of energy in which we ask the mineral world for help to purify ourselves, or eliminate anything not useful to our quest for energy. 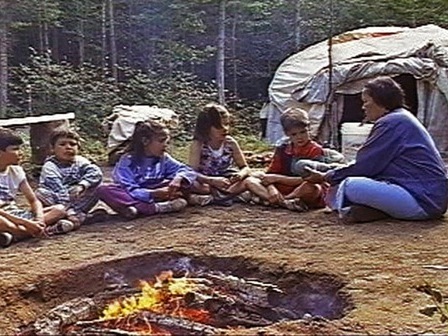 By a pile of rocks worn down by fire and a circular tent near the forest, an elder explains the rudiments and rules of the sweat lodge to a group of children sitting near the fire. Shash tapue mishtikushuat apashtauat nenu ka aitinanunit ueshkat, apu itenitakuak nene ka ishpitenitakanit ueshkat ka aitiht tshimishuminuat. Tshekuanitshe ma uet eka itutaiakaniht anite ka ishinikatahk "sauna". Miam mianenitakaniti etenitaman ne aitun. Un aîné m'avait raconté que l'utilisation du «matutishan» était de dernier recours, à cause de son pouvoir sacré et de sa valeur spirituelle que les anciens d'autrefois y accordaient, et lorsque l'on avait essayé toute possibilité de guérison d'une blessure physique par exemple. Merci!